As my wife was reading through past editions of this blog, the ones she hadn’t quite gotten around to reading, (You too? Not to worry. I don’t read them all either.) she stumbled on a recurring theme: My children are not all that fond of my creations. I am sure that if my eight- and ten-year-old actually read the blog instead of just sampling a spoonful here and there, they would feel differently, but they don’t. Does that mean I’m going to elevate the level of discourse to please them? I’m going to do what anyone who is not a media darling or a principled politician would do—pander to their basest instincts. 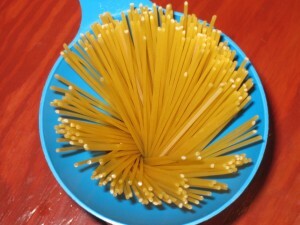 One of my children’s favorite meals, after tacos and pizza and chili , is spaghetti. It was that way in my and my wife’s houses growing up too, a trend that undoubtedly goes all the way back to the old countries, i.e. Germany, England and Scotland. That is where this week’s soup recipe came from, that and the fact that I’ve already made taco soup and chili (twice) and I wouldn’t begin to know how to make pizza soup (yet). The roots of my family’s spaghetti began in my mother’s kitchen, back before her conversion to vegetarianism. In those days my mother used to make a spaghetti with meat sauce using tomatoes, garlic, ground beef and, in all likelihood, a few other things. It was delicious. All of us loved it. That is not, however, the recipe we use in our house today. Just as my mom improves each of my soups as she translates them into “Vegetarian” out in California, so I have developed an improved spaghetti with meat sauce. Note: I never actually bothered to ask my mom how she made her recipe. So my conception of its overall quality and the ingredients she used are really just a matter of childish conjecture and a fond memory. What I do know is that my spaghetti sauce is composed of Italian sausage, red wine, garlic, basil, oregano and fennel seeds and it is very, very good. To convert the sauce into a soup, I had to add a few cups of stock to the mix and break all the spaghetti noodles into small pieces so my guinea pigs children could eat them with a spoon. The result is comfort food pure and simple. And what did I get for my efforts at indulging my children’s “developing” palates? Well, my wife loved the soup, as did I. And happily my children enjoyed it very much as well, despite the lack of bells and whistles (i.e. garlic bread). My eldest daughter plowed through her bowl in a matter of minutes. Heat the oil over low heat in a 3 quart soup pot, then add the onions and sausage. Mash the sausage with a potato masher to break the large chunks into smaller pieces and stir the mixture until it begins to brown. Next add the garlic and sauté for a few minutes more (being careful not to burn it. You know I hate burnt garlic.) Then add the tomatoes, paste, herbs, stock wine, and seasonings, bring the soup to a boil and reduce to a simmer for about an hour. Then add the broken spaghetti and continue to simmer the soup until the noodles are done. Garnish each bowl with a sprinkling of parmesan cheese over the top. Garlic bread is optional, but it’s a terrific pairing. Image Credit: “Funnel Full of Noodles,” photographed by the author. Spaghetti is a great meal for a cool winter’s evening. Like the ones we’re having right now in the Midwest and the ones we had in California as well. Why should a spaghetti soup be any different? Let me know in a comment. I’ll be reading and responding.